1. 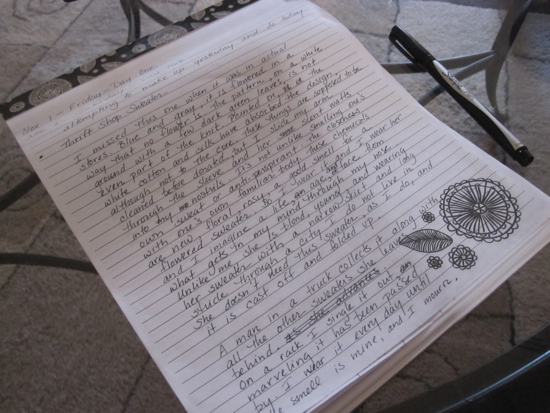 I can write creatively even on days when I have lots to write analytically. Constant analytical demands do not ‘kill’ the occasional creative ones. 2. Paper is a nice change of pace. 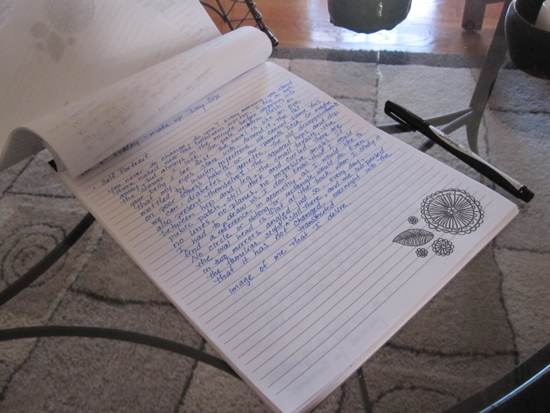 On Day One, sick of my laptop, I grabbed a new pad of paper and a pen and wrote my lines on lines. It worked. I’ve stayed with the handwritten medium for the whole 10 days so far, and I find the blank notebook page to be more inviting and the whole experience to be more pleasingly tactile. 3. A new ritual heightens the experience. At around 9pm, I stop the chores or take a break from paper-grading and set my paper and pen on the kitchen table. Jimmy, who is writing short stories during NaNoWriMo, joins me with his laptop. I take out a juice glass and pour some wine for myself. (If you know me, you know this is typically not me.) I do not fret; I write. 4. I’m using this as an opportunity to discover what is prose, and what is prose poetry. I like introductions and I like context, and I have found that this is my customary gesture: to begin by situating the reader. A few sentences in, I realize I am explaining too much, setting a scene too much, and I pull back and try to turn off that part of my brain. (A teaching part, maybe.) Poems may not have story logic, I remind myself. I try to follow images that may not make sense. I leave gaps. 5. The constraints of a page remind me that a poem has to conclude. When I’m within about three inches of the bottom, I start to wonder how I’m going to see it through. That awareness causes what feels like a downshift or upshift, as though my imagination were a motor. The poem turns. 6. Knowing that writing is on the evening agenda, during the day I keep my eyes and ears open for inspiration. One day, driving to the rink for a skating lessons, I heard an ad for No Doz. The tag line, unbelievably, is “a trusted leader in mental alertness.” At the next stop light, I wrote down what I planned to make as a first line: “He is a trusted leader in mental alertness.” At 9pm that night, I wrote a poem about him. 7. I cannot start after 10pm at night. My brain cannot generate anything new. (Funny, I can grade papers after 10pm at night.) I thought that fatigue would help strike down mental barriers to creativity, but it only strikes down enthusiasm and vocabulary. 8. Only a percentage of my output delights me and may lead to something. I see that this exercise might yield only a couple of poems, and those will need revision. So far, my favorite thing is a title I came up with for a poem: “The Dead-Cold Peace of Saying No.” The poem is so-so, but that’s okay. The daily writing is bringing something to life. “The Dead-Cold Peace of Saying No.” Scary, but I’ve been there. What a title! So revisit and publish it already! I’ve been mulling over your #1 since I read it: writing analytically doesn’t stop me from writing creatively. It’s so true! In fact, sometimes writing creatively can get me through a huge block on writing analytically. I hadn’t tried it because with reading, it’s very different (for me). Too much analytical reading stops me from recreational reading. Thank you for this insight.